Forex4You was originally incorporated back in 2007, in the British Virgin Island as a holding company named E-Global Trade & Finance Group, Inc. The business currently specializes in providing amongst other services online forex trading mainly geared towards retail traders from across the world. Forex4You is a relatively small business, though it is still one of the most popular retail forex trading brokers owing to its commitment to providing quality customer service. Each individual trader is treated well regardless of the volume they trade. Over the years of reviewing brokers, we have come across very few who offer cents trading accounts which are best suited to the needs of a newbie trader. Its ideal since most newbie traders have very small trading budgets or they just want to test the waters. Forex4You has an operational history for around six years, so it is a relatively new company in the industry. In contrast, many well known or leading brokers like FXCM and Alpari have been around for over a decade during which they have established an excellent reputation. However, despite being relatively new, the company has done exceptionally well. Apart from Forex4You being a relatively new company something that some forex traders may find unsuitable the other issue is competing brokers. Forex4You has to compete with other brokers and operating out of the British Virgin Islands does make that challenging owing to the perception associated with it. Many brokers believe that retail trading is best done in a company that’s not located in a tax haven like the British Virgin Islands or the Cayman Islands. The reason being that the regulatory authorities are considered as being comparatively lax when it comes to enforcing trade law. Some may not even investigate small breaches in the law. So, traders don’t get as much legal protection as they might want from these regulatory bodies. Though in reality that’s not really the case. During the 2008 credit crunch, there were many financial institutions responsible for the mess up with the majority of ones based in America. That is despite the US having some of the most stringent financial regulatory laws in the world. However, despite all that strict regulation, they were unable to prevent the unfortunate credit crunch. Now contrast that with the British Virgin Islands, about which the IMF said back in 2010 that the credit crunch or financial crisis was not affecting or caused by financial services that were registered in BVI. The statement by the IMF proves that the FSC or Financial Services Commission of the British Virgin Islands is much more capable of enforcing financial laws than other countries. Furthermore, in 2013, the FSC signed an MOU with 31 other European regulatory authorities which ease cooperation amongst the agencies. So, now the BVI’s FSC is recognized by other financial regulatory authorities across Europe and even internationally. Now in addition to many other businesses in a regulated environment, the reason behind Forex4You’s success has been its commitment to retail traders. The broker takes every step imaginable to be transparent and work together with traders to resolve their issues. The approach has helped Forex4You gain a reputation for being helpful and consequently build a loyal following of traders. The vast majority of traders have continued to trade with Forex4You for years because they found the broker reliable and helpful. Forex4You only has one standard operating trading platform which also happens to be one of the most popular around, i.e., MetaTrader 4 or MT4. 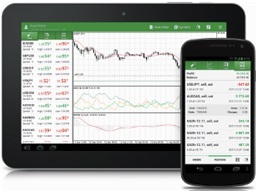 You can also download the MT4 and 5 platforms from their official website. The objective of this account is to get new traders into the door. It is meant to keep the initial deposit low allowing them to test out the market. Traders can deposit anywhere from $.01 to .10 cents. Traders can also use the account to test out new strategies without incurring massive losses as a consequence. The Classic Account is for those who have already gained some experience. Plus, they can bankroll a few hundred dollars for their trading activities. The Percentage Allocation Money Managment (PAMM) accounts are for money managers who have their own investors’ money to trade with and manage. In short, it is a professional account for traders with a considerable volume. It is also for professionals who welcome a minimum spread. Forex4You is one of the few brokers out there who do not charge a commission for their services. However, they do impose a charge on top of the prices which is added to the market quotes. The normal spread payable is at 2 pips for popular currencies like EUR/USD. The Non-Dealing Desk accounts benefit from a spread rate starting at 0.75 pips. Forex4You provides around the clock customer support 5 days a week, i.e., when the markets are open. Traders can contact the support team over the phone, via chat or regular email. The response time over live chat as we experienced was good. They responded within a minute to our request. Plus they offer support in many different languages like Hindi, Mandarin, Malay, and Cantonese. Though they take up to 21 hours to respond to emails on average. The service also allows traders to order a withdrawal via Payoneer’s Mastercard. The withdrawal time with this option is around 24 hours. Despite offering traders everything they will need to trade successfully, similar to all well-known brokers we are in awe about their excellent quality of service. Perhaps that’s the reason why many people choose to get onboard and use the service. Regardless of them being relatively new or the size of your trading volume you are still treated well. We also liked their cents account which makes it easy for people who are new to start trading without risking a lot of money. 7 Binary Options review: Forex4You: 4 stars.